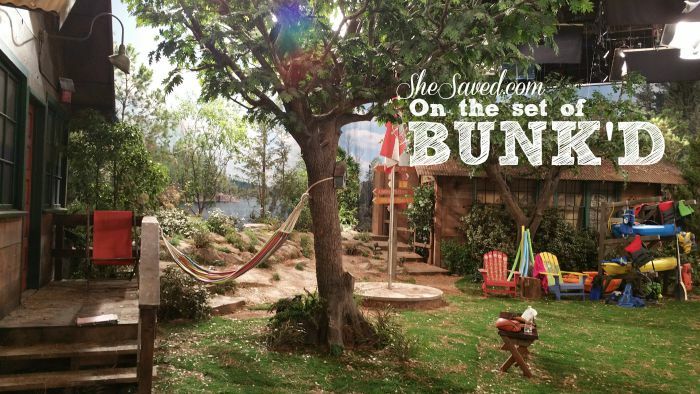 Behind the Scenes: BUNK’D Airs July 31st on The Disney Channel! If your kids love Disney Channel shows like mine do, then they are going to FLIP over one of Disney’s newest shows: BUNK’D. Make sure to mark your calendar (and gather up the kiddos!) because BUNK’D airs for the first time tomorrow night, Friday July 31st on The Disney Channel! BUNK’D is a spin off off the very popular Disney Channel Show Jessie. 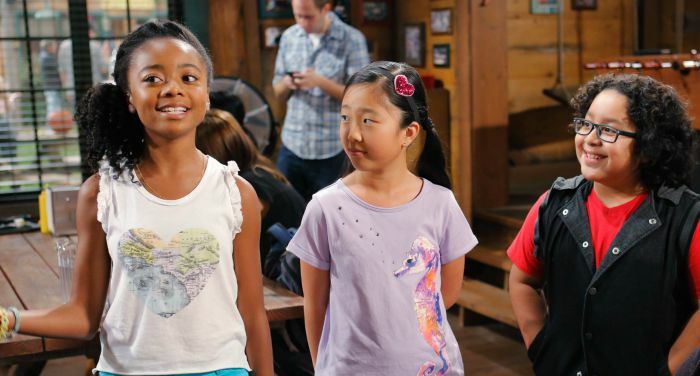 Karan Brar (Ravi), Skai Jackson (Zuri) and Peyton List (Emma) are the three kids that are transitioning over to this new show, and will be joined by Nina Lu (Tiffany), Miranda May (Lou), Nathan Arenas (Jorge) and Kevin G. Quinn (Xander). Together these talented kids make up the cast of enthusiastic (and hilarious!) young campers at Camp Kikiwaka. 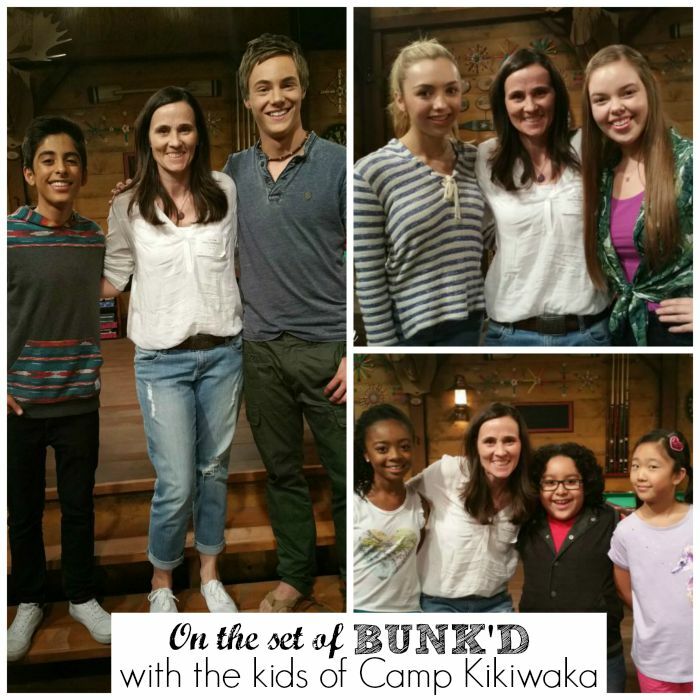 I had so much fun checking out the BUNK’D set and chatting with these kids. What a neat bunch of young actors! They are all so talented, friendly and very well spoken. We had the opportunity to speak with each one of them and I was so impressed with how open they were about their experiences and child actors, and it was also neat to see their true passion and love for their time together as well as their time on the set. You might also know Skai Jackson (Zuri) from Jessie, she is darling and she and her new cast members Nina Lu (Tiffany) and Nathan Arenas (Jorge) are as sweet and cute as can be! They also recorded a sweet message for my daughter (you can see that here – aren’t they too cute!!?) and I can’t wait to see them in this series. And I have to mention, that little Nathan Arenas – I just wanted to take him home with me, he is the cutest little thing ever! No doubt he will steal some scenes! Kevin G. Quinn (Xander) and Karan Brar (Ravi) were very excited about their new adventures on the set of BUNK’D and I think that you are really going to enjoy their characters in this series. I was so impressed with them! Peyton List (Emma) and Miranda May (Lou) were so sweet! They are really wonderful young ladies – so warm and friendly and I’m so happy to have my children looking up to all of these kids. Now that I have met them in person, I can tell you – I am truly impressed! From what I have seen of the new series so far, Peyton’s character Emma is darling as always and Miranda – she plays a very fun character named Lou – you’ll REALLY get a kick out of her! What I love most about these Disney shows, and this one especially – since I have met the kids and been on the set – is that they are simple story lines that kids can relate to. They incorporate humor and life lessons in situations that young people can learn from while being entertained at the same time. And…of course, I’ll be right there watching it with them! BUNK’D airs Friday night, July 31st right after the Disney Channel premiere of DESCENDANTS!